A collection of Real de a Ocho (or Eight Reales or Pieces of Eight) from Spain and Spanish New World Colonies and specifically of the type known as bust or portrait dollars of Charles III. In 1772, Spain decreed a lower silver content for their coinage and introduced a new design with the portrait of the reigning monarch, Charles III, on the obverse and the crowned shield of León and Castile between the Pillars of Hercules on the reverse. Despite this change from the well-known columnario/pillar dollar design, the portrait eight reales were widely accepted as international currency due to the consistency of silver content and uniform milling characteristics that made them difficult to counterfeit. These coins were so abundantly minted and used in commerce that they were legal tender in much of the world. They made up the majority of specie in the US, well after the US began minting its own currency, and were the preferred trade dollar with China. Madrid -- Capital of Spain since 1606, its mintmark is distinguished by the crown above the 'M'. It was not one of the main mints of Spain until the 17th century. 8 reales of the macuquina type (cobs) first appeared in 1620 according to Cabeto. Charles III portrait 8 reales were issued from 1772-1775, 1777, 1782 and 1788. Seville -- An ancient city that produced coins for Romans and Goths, its zenith during the Spanish Empire was its period as the home of La Casa y Audiencia de Indias, the agency for all colonial exploration and trade, from 1503-1717; Seville's mint handled much of the precious metals from the New World. Its mintmark is 'S'. Charles III portrait 8 reales were issued from 1772-1779 and 1788. Mexico City -- The oldest mint in the Americas was established in 1535 in the capital of the Viceroyalty of New Spain. 8 reales were not issued until the reign of Philip II (1555-1598). The common mintmark is 'M' with a small 'o' above. The first two years of the Charles III portrait type are known for the inversion of the mintmark and assayers initials. Charles III portrait 8 reales were issued from 1772-1789 and posthumously in 1789 and 1790 with the bust of Charles III and legend for Charles IV. Guatemala City -- Capital of the Captaincy General of Guatemala, a large region that included El Salvador, Honduras, Nicaragua, Costa Rica and Chiapas; minting started in 1733 with old equipment and tools from Mexico City and used the mintmark 'G'. The Charles III portrait 8 reales started in 1772 but were interrupted in 1773 by earthquakes that resulted in the movement of the city and mint away from the highlands, 40 miles to the Northwest. 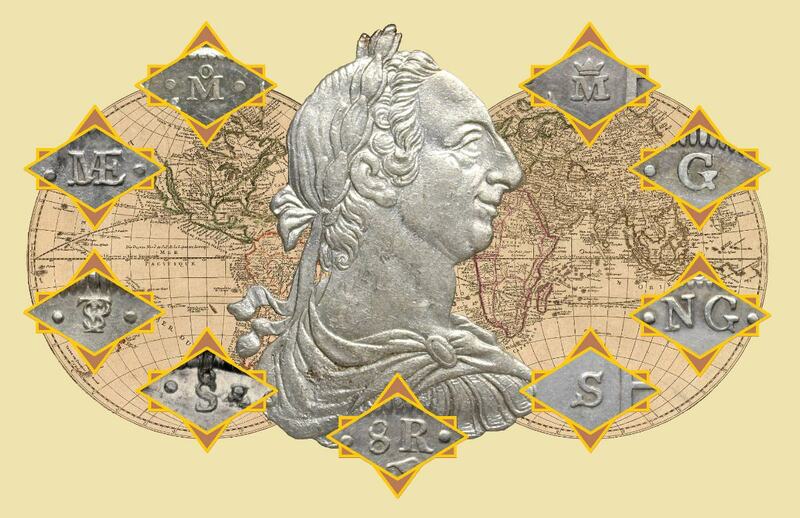 The new mint began 8 reales production again in 1777 and began using the mintmark 'NG' for Nueva Guatemala (New Guatemala). Issues continued until 1789 with posthumous issues in 1789 and 1790 with the bust of Charles III and legend for Charles IV. My set includes examples from both mints. Lima -- Capital of the Viceroyalty of Peru, it was granted minting authority in 1565. Starting with the Charles III portrait issues, its mintmark was a monogram combining the letters 'LIMAE'. These continued from 1772-1789, with posthumous issues from 1789-1791 with the bust of Charles III and legend for Charles IV. Potosí -- Established in 1543 as a mining town at the foot of a mountain with the largest known silver deposit, Potosí was part of Alto Perú (Upper Peru), which would be renamed Bolivia, after independence, in honor of the general and political leader Simón Bolívar. Alto Perú was part of the Viceroyalty of Peru until 1776, when it was shifted to the Viceroyalty of the Río de la Plata in hopes of countering the growing influence of Portugal in the region. With the beginning of milled coinage in 1767, it adopted the mintmark monogram with the letters 'PTS'. Charles III portrait 8 reales were issued from 1773-1789 and posthumously in 1789 and 1790 with the bust of Charles III and legend for Charles IV. Santiago -- Capital of the Captaincy General of Chile, its mint was first authorized as a private endeavor in 1743. It minted what the region mined which was mainly gold. Charles III brought the mint under the crown in 1770. The mintmark is 'S' with a small 'o' above. Silver issues are scarce and the Charles III 8 reales portraits are known for 1773, maybe 1774, 1775-1789, with posthumous issues from 1789-1791 with the bust of Charles III and legend for Charles IV. Quality 8 reales of the 1772-1791 design. My interest in collecting coins started in 2009 with the impulse purchase of a 1783 shipwreck coin. I did not imagine that collectible grade 8 reales coins were available until I started browsing the internet to see whether I got a good deal. The sheer quantity of mintage and scope of exchange of these coins is astounding and their popularity with collectors everywhere is impressive. Truly the first global currency. After I realized what a lousy deal those "America's first silver dollars" are, I set out to build a collection of quality 8 reales of the same design as that first coin. I hope you enjoy my set -- it's been a pleasure to build and curate. View Coin 1772 Mexico City, inverted MF MEXICO - TO 1823 8R 1772MO MF INVERTED "MF" NGC AU 50 First year of the portrait design on Spanish silver coins. This example is from the Mexico City mint where, in the early years of this type, there was some confusion as to the proper orientation of the mintmark with respect to the other legend text. This issue shows the mintmark in the same orientation as the previous pillar design -- the assayer initials are also in the same orientation -- but in opposite orientation to the rest of the legend text. In addition, this coin is the rare variety where the initials have been transposed from "FM" to "MF". Subsequent issues, starting in 1773, reversed the alignment of the mintmark and initials to be consistent with the rest of the legend text. From the April/May 2012 Heritage auction, Chicago, lot #25106. KM106.1. "Premium quality for the grade, with a nice strike, few marks and overlying olive brown tone on both sides that is attractive and entirely original." View Coin 1773 Antigua Guatemala GUATEMALA - COLONIAL 8R 1773G P Ex. Gaspar de Portola NGC UNC Details Second year of the of the portrait design in the Captaincy General of Guatemala, the Spanish administrative region that included modern day Guatemala, El Salvador, Honduras, Nicaragua, Costa Rica and the Mexican State of Chiapas. This coin was minted at the earlier Guatemela City, also known as Santiago de los Caballeros (and later known as Antigua Guatemala), which was the capital city at the time. Both the capital and mint were moved to a different location, due to the damage from earthquakes in 1773. As this coin is an issue from the year of the earthquake is it more scarce than the 1772 issues. This coin has the G mint mark; after the move, coins would use the NG mint mark for Nueva Guatemala. View Coin 1774 Potosi, MS hoard BOLIVIA - COLONIAL 8R 1774PTS JR NGC MS 62 Although no pedigree was mentioned in the auction listing, given its date, mint and condition, this coin is likely from the small, buried hoard discovered near Potosi that is thought to have been hidden prior to the Great Aymara Rebellion of 1780. Due to this find, many mint state examples of this year/mint are available to collectors. Purchased from the Stack's Bowers/Ponterio & Associates, Inc. 2011 N.Y.I.N.C. Auction. KM-55; FC-6; El-12. View Coin 1775 Mexico City, top pop MEXICO - TO 1823 8R 1775MO FM NGC MS 62 Highest NGC or PCGS graded example. Full luster and sharp strike on both sides with slight gold toning along top rims. Purchased, freshly slabbed, from Mexican Coins and More in July of 2013. View Coin 1776 Mexico City, top pop MEXICO - TO 1823 8R 1776MO FM NGC MS 63 Highest NGC or PCGS graded example and shares the honor of the highest graded coin in my 8 reales collection with one other from Peru. Full luster and sharp strike on both sides with just a little weakness above the crown on the reverse. I note that the portrait has a curiously different aspect from the standard appearance. Purchased, freshly slabbed, from Mexican Coins and More in October of 2013. Any 1776 coin is popular with US collectors and typically sells at a hefty premium -- this one was no exception. View Coin 1777 Mexico City, scarce FF MEXICO - TO 1823 8R 1777MO FF NGC AU 53 Quality 1777 8 reales from Mexico with the FF assayers are difficult to acquire. I was fortunate to notice right away when member TwoKopeiki put this example on the sales forum. This one has a full strike, and proof-like fields with some colorful toning near the rims. ex 8 Reales Madness and ex Mike Dunigan from the CICF in 2011. View Coin 1777 Potosi, top pop BOLIVIA - COLONIAL 8R 1777PTS PR NGC MS 62 This is the finest known NGC or PCGS graded example. Purchased from Dan Sedwick's Treasure Auction 12, Lot# 1269, October 2012. This specimen is quite lustrous and very lightly toned, no wear but a few minor surface marks from incidental contact. View Coin 1778 Mexico City MEXICO - TO 1823 8R 1778MO FF NGC MS 61 Pedigreed to the Q. David Bowers Collection and previously purchased privately from John Kraljevich who indicated that it came from a hoard found in Haiti, which contained nearly exclusively Mint State eight reales from the mid to late 1780s. They may have been hidden in response to the slave revolt in 1791 that evolved into the Haitian Revolution. Reflective lustre with a touch of iridescent toning. Light marks account for the modest Mint State grade. View Coin 1779 Mexico City MEXICO - TO 1823 8R 1779MO FF NGC MS 61 One of very few PCGS encapsulated coins in my collection that I have moved to NGC. When I started my 8 reales collecting in 2010, I chose NGC as my primary grading service in large part because the registry allowed sets to include PCGS coins. Unfortunately, this policy was changed for competitive world coin sets in 2012 so it could not appear in my competitive sets until I crossed it in 2017. From the Stack's Bowers August 2012 Philadelphia ANA World's Fair Of Money Auction, Lot# 40684. KM-106.2; FC-62a; El-89. Fully lustrous and choice. Former PCGS MS-61. View Coin 1780 Lima, top pop PERU 1659-1826 8R 1780LIMA MI NGC MS 63 One of my finest 8 reales, by grade, is this example from Peru. Clearly, the graders appreciated the wonderful strike and lovely toning on the reverse. However, the obverse is a different story, struck with a later stage, and perhaps rusty, die. View Coin 1781 Mexico City MEXICO - TO 1823 8R 1781MO FF NGC AU 58 This is the fourth coin I've purchased (three raw and one from another TPG) for this slot and only with this one did I get a full grade. Clearly I saved the best for last as this is a bright and mostly problem free example. From the February 2013 Soler y Llach Subastas, Barcelona, Lot #0637. Restos brillo original. (Pequeños golpecitos. Zona de plata algo agria en anverso). Cal-931. EBC-/EBC. View Coin 1782 Mexico City MEXICO - TO 1823 8R 1782MO FF NGC AU 55 When I started collecting 8 reales I preferred to buy raw coins, but I'm always on the lookout for a nicer example. This one is a case where I was able to win a better slabbed coin and upgrade my slot. From the Heritage January 15-16 2013 NYINC Auction, Lot #28495. KM106.2, Impressive luster and very little wear. View Coin 1783 Mexico City, GB C/S MEXICO - TO 1823 8R 1783MO FF PCGS XF 45 For the 1783 slot I've decided to showcase a nice XF example, counter-marked with the bust of George III from 1797 when it was reissued as legal tender in Great Britain due to a shortage of silver. 1783 is a key date for my collection since it was an impulse purchase of an 1783 8 reales from the wreck of El Cazador that got this all started. View Coin 1784 Mexico City, rare FF MEXICO - TO 1823 8R 1784MO FF NGC XF 45 This coin is one of those special finds that is the exciting part about this hobby. The variety is scarce as it is the last appearance of the initials F.F. (assayers Francisco de la Peña and Francisco Arance Cobos) on the Mexico City 8 reales. The common variety of the 1784 feature the initials F.M. (for Francisco Arance y Cobos and Mariano Rodríguez). I had never seen this variety for sale and won it in the February 2012 Cayón Subastas, Madrid, Spain, Lot #839. It can take months to get coins from Cayón because they get official export licenses for each coin. Patience, however, is a part of this hobby too. I was rewarded when this coin got its XF-45 grade from NGC. View Coin 1784 Lima, top pop PERU 1659-1826 8R 1784LIMA MI NGC MS 62 Well struck and lustrous example. From the Heritage Ancient & World Coin Signature Auction, January 5-6, 2013, New York. From the auction catalog "lightly toned and original with full mint luster, just a light scattering of contact marks in the obverse fields. Full sharp PLUS ULTRA"
View Coin 1785 Lima PERU 1659-1826 8R 1785LIMA MI NGC AU 53 My first experience with Great Collections is this slabbed 8R from April of 2013. 8Rs don't show up much on GC so there was not much interest in this coin. It's well struck with an unfortunate blemish around the N in HISPAN but otherwise retains much of the original luster. View Coin 1786 Mexico City MEXICO - TO 1823 8R 1786MO FM NGC AU 58 Another raw coin that graded above expectations and purchase price. From Daniel Frank Sedwick's Treasure Auction #8 of October 2010. Lot# 2184. KM-106.2; CT-939. 26.9 grams. Lustrous AU with gorgeous rainbow toning all over. View Coin 1787 Santiago CHILE - COLONIAL 8R 1787SO DA NGC AU 58 The most scarce example in my set is this one from the Santiago mint with a recorded mintage of just 183,209 (Elizondo). The mint, in the capital of the Captaincy General of Chile, was first authorized as a private endeavor in 1743. It minted what the region mined which was mainly gold. Charles III brought the mint under the crown in 1770. At the time this coin was produced the mint had moved from its original building to a former Jesuit school, Colegio Máximo de San Miguel, however construction of the new mint facility, Palacio de la Moneda, had already begun. The elaborate building would later become the seat of government which it still is today. Purchased from World Numismatics (formerly known as Mexican Coin Company) in January of 2016. Pop 3/0. ex Ira & Larry Goldberg Coins & Collectibles Sale 42, September 2007. View Coin 1788 Seville SPAIN 8R 1788S C CHARLES IIII NGC AU Details My nicest example of the Charles III portrait design from Spain is the last in the series as the monarch died in December of the same year, 1788. It is also the first 8 reales issued from the Seville mint since the 1779 mintage, likely suspended in order to prop up the royal coffers by only minting the debased 1 and 2 reales during this period. On the Spanish minted coins, the portrait is different from the colonial design in that the bust is fully draped and without laurel wreath. The obverse is the crowned Spanish arms but without the pillars of Hercules. Raw coin from December 2013 Aureo & Calicó Subastas, Barcelona, Lot # 2054. (Cal. 1042). Bella. Ex colección Jose Leunda, Áureo & Calicó, 30/XI/2011, nº 522 . Muy rara así. EBC-. View Coin 1788 Madrid SPAIN 8R 1788M M CHARLES III NGC VF 20 This worn specimen is my only example of the Charles III portrait design from the Madrid mint. It was the first 8 reales issued from the Madrid mint since the 1782 mintage. Other than the crowned M mint mark, the design is the same as the other principle Spanish mint of the time, Seville. These coins rarely show up in US auctions but I found this one on Ebay in June of 2010 and was fortunate to get a full grade. View Coin 1789 Mexico City MEXICO - TO 1823 8R 1789MO FM "CAROLUS III" NGC MS 62 The 1789 CAROLVS III variety is somewhat scarce and not at all plentiful in mint state, likely due to the transition to CAROLVS VI legend. Super sharp strike, frosty devices; two die cracks above the crown. From the Heritage 2012 January World Coin Auction. From the catalog "some Prooflike characteristics. Posthumous issue struck after the death of Carlos III. An outstanding example of the type." This was originally a raw purchase, then graded by NGC, crossed to PCGS and later crossed back at the current grade. View Coin 1789 Mexico City, ex Norweb MEXICO - TO 1823 8R 1789MO FM "CAROLUS IV" NORWEB COLLECTION NGC AU 58 After the death of Charles III in December of 1788, the colonies experienced a delay in receiving the matrix blocks that provided the master design for new coins and the all important portrait of the successor monarch, Charles IV. Part of the reason for the delay may be attributed to Charles IV himself, an entirely lackluster leader, more interested in hunting than in the administration of his empire. Therefore, the overall design remained the same in 1789, some with the legend CAROLUS III and some, like this example, with the change of the legend to CAROLUS IV. This coin was purchased on Ebay in December of 2010. It is pedigreed to the Norweb Collection and is noted as being ex Von Shuckman Collection and more recently ex Heritage Signature Auction #3009, Rosemont, IL, April 2010, lot# 22306. View Coin 1790 Lima, Bust of Charles III PERU 1659-1826 8R 1790LIMA IJ NGC AU 58 Transitional type with portrait of Carlos III, and title of Carlos IV. Slabbed purchase from the Stack's Bowers November 2013 Baltimore Auction, Lot #21250. Unlike the Mexico City 8 reales busts at this auction purchased by other bidders, I got this one for a reasonable price. KM-87; FC-48; El-50. Fully struck, bright luster with light toning with the exception of a few contact marks on the obverse this coin would likely grade as MS.
View Coin 1791 Lima, Bust of Charles III PERU 1659-1826 8R 1791LIMA IJ "CAROLUS IV" NGC VF 35 By 1791 all of the colonial mints had changed their 8 reales designs to feature the portrait of Charles IV with the exception of the Lima mint in Peru. For part of their mintage they continued to use the portrait of Charles III with the legend CAROLUS IV, as in this example. KM-87; CT-643. 26.4 grams. Bold VF+, cleaned and lustrous, with incipient rainbow toning, slightly crude rims (as made). The raw coin was purchased in April, 2010 from Daniel Frank Sedwick's Treasure Auction #7, lot# 1633. Pedigreed to the Mark Bir collection.